The Bonneville Bobber, launched at Rs 9.09 lakh, is available with over 150 accessories for style, detailing and comfort. 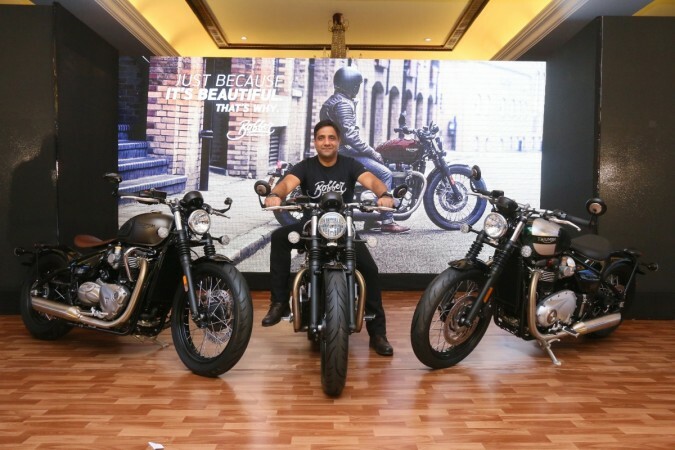 British motorcycle maker Triumph Motorcycles made another addition to the Bonneville family in India, the Bonneville Bobber. The Bonneville Bobber has been priced at Rs 9.09 lakh (ex-showroom, Delhi). Powering the new Bonneville Bobber is a 1200cc, liquid-cooled, parallel-twin motor borrowed from the Bonneville T120 that produces 80bhp and 105Nm of torque. Based on the Triumph Bonneville T120, the Bobber gets authentic battery box with stainless steel strap, bar end mirrors, rear mudguard loop, carb styled twin throttle bodies, broad adjustable levers, traditional rubber gaiters, classic rear 'drum brake' inspired hub, new side panel and sprocket cover with removable inspection cap. The Bonneville Bobber features new cage-type swingarm and a mono shock, which is mounted underneath the seat. The setup makes the motorcycle appear without rear suspension. Other features include 'clean line' Bonneville technology packaging system, which includes the straight line hidden 'cat box' pipe run and the sensitive incorporation of rider focused technology such as the ECU, ABS modulator and immobiliser.